Amazon Listing Hijacker | Is Amazon Protecting Your Products? If you are an Amazon seller, you may have received an email with the foreboding subject line, “Important Information about your Seller Account”. However, the policy updates will actually be favorable for sellers. In short, Amazon will require approval to sell some private label brands. 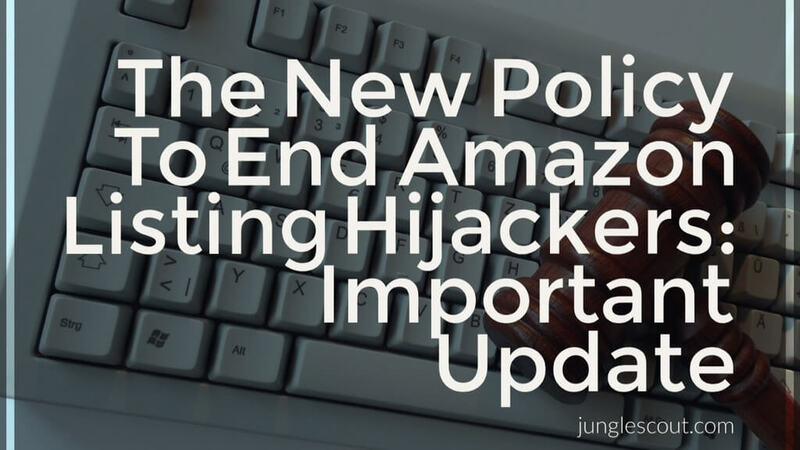 Note: if you’re looking for advanced help with Amazon Listing Hijackers or getting your product onto Amazon, be sure to check out our product listing helpers over at JungleMarket. 1. In Seller Central, click the Inventory menu, and then select Add a Product. 2. Search for the ASIN you want to sell. 3. In the search results, click the Listing limitations apply link next to the ASIN. 4. Click the Request Approval button to start the application process. * A letter of authorization from the brand owner confirming that you are authorized to sell affected branded products. 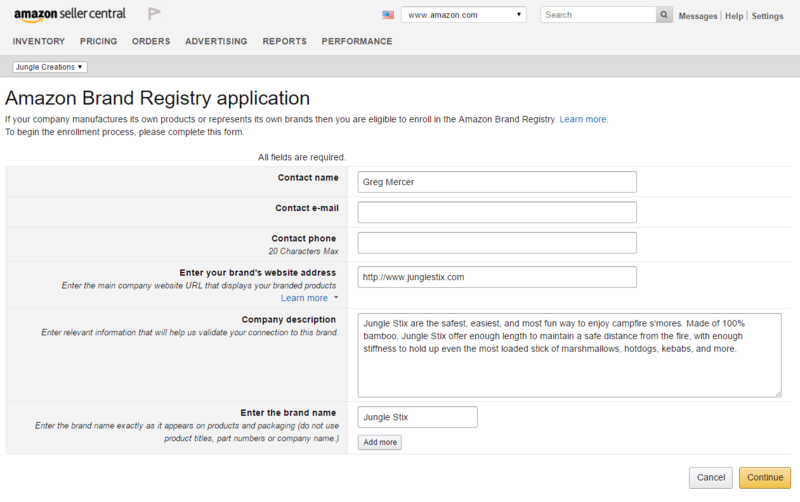 I think that this will encourage private label sellers to go through the Amazon Brand Registry program to register their brands in order to gain approval. Influence the product detail information for your branded products: As the registered brand owner, you will have increased influence in editing the information on product detail pages for your registered branded products, which then helps you to specify the correct titles, details, images, and other attributes for your branded products. List products without standard product IDs: Registering your brand enables you to specify an alternative key attribute that you can use to list your branded products instead of a standard product ID (UPC or EAN). I set up my brand registry in about two minutes. It is super simple, it can be done in two quick steps, assuming you have a landing page set up for your product. If you don’t have that, fear not, it is much easier than it sounds. I would recommend purchasing a cheap domain on GoDaddy, and directing it to a free WordPress.com theme. It doesn’t take any technical skills to set up your website, just following the instructions carefully. After completing the two pages, you get this notification of completion! Why Is This Policy Change Important? This policy change is important because it restricts how people can sell a private label brand. It is now not so easy for anyone to sell just any product, which means that you will have to have registered a brand in order to sell the brand. I am not completely sure at this point whether this will effect only major brands, or any private label brand. I will certainly update this as it becomes more clear (Amazon’s policies are never crystal clear right away). Moreover, I am not positive yet whether this application is necessary only for brands which have gone through the Amazon Brand Registry. I think what is clear though is that many sellers will get their brands registered. And with a process that is so simple, as noted above, why not?! This is a good step to take in order to protect your brand against hijackers, so that the whole problem of listing hijackers will be a thing of the past. One interesting ripple effect will be on people who do retail arbitrage–buying products at a steep discount and reselling them for a profit on Amazon. This new policy change may not effect some of the large Retail Arbitrage sellers, however, the smaller sellers may have to make significant changes to their business. This means maybe shifting towards private label sales. These are simple steps to take, and could prevent major headaches in the future. In an ecommerce environment that is getting more competitive, and which relies on brand differentiation and customer loyalty, I think that this just forces our hand to do what should have been done already. 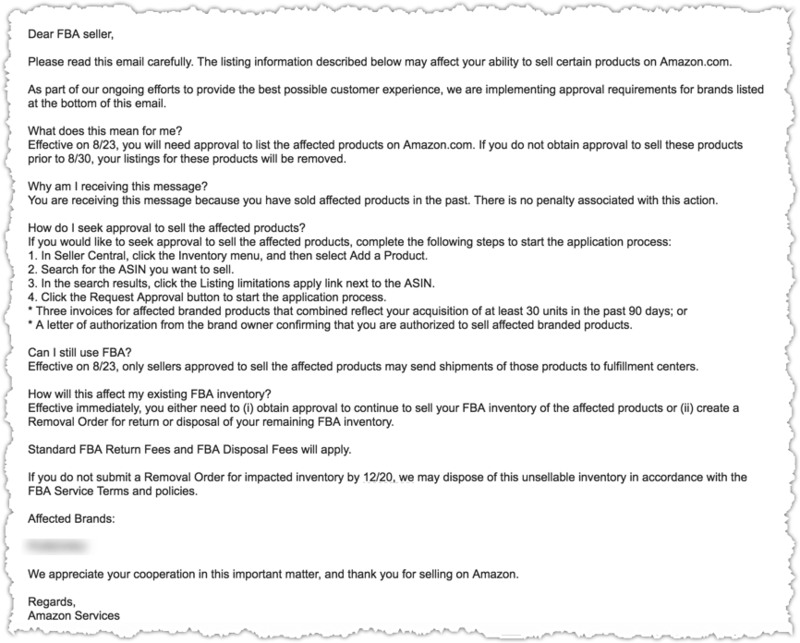 If you have any different interpretation of this policy update, or have received direct feedback from Amazon’s Seller Support, please share your thoughts with the community in the comments section below! Likewise, I will share any updates that I receive as soon as possible. ok i am confuse and not!??! so i am trying to sell this product, not counterfeit, actually better and more improved than the original product, BUT the original brand owner(not a big brand at all, in fact fairly new) patent this product and had an agreement with amazon that no one is allow to sell this product. but i see the same product on amazon with different colors or style by different sellers? also under the JSpro ext. it says AMZ as the main/BS and FBA for others. so can i or can i not sell this item?!?!? i dont want to spend $8k and it be a waste!! of course i will brand registry this item but i willt buy from alibaba and made it 3X better and put my private label on it. Hi guys, I buy my domain in GoDaddy and now i want to use Free wordpress. As Greg mercer says. ” Brandname.wordpress.com “¿That’s fine? There will be problems with Amazon when registering my brand? I have the same question as Chris above. What happens after your brand gets approved? Do you need to create a new listing? or update the listing? thanks! Are all categories being contacted? I am in Sports and Fitness and my listing has just been hijacked. Anything that helps stop it happening in future is great. I’ve only been live a month so it has been a very steep rollercoaster of a learning curve! Your listing hasn’t been hijacked. Anyone can resell your items without your authorization. If you’re doing giveaways or selling at steep discounts, other sellers are going to buy your items and resell them. That’s not hijacking, that’s the rules of selling on Amazon. A true hijacking is when a company (usually a foreign manufacturer) sells a counterfeit item against your ASIN. As new as you are, this is highly unlikely. Always remember, Amazon owns the ASIN, not you. When you create a listing, anyone can sell against that listing, provided they are actually selling that item and not just a similar or counterfeit item.